While it was obvious to those of us in the troop, it was confirmed to the everyone that Rob Stanford is a leader with merit. Last evening at the annual Saugahatchee District Banquet, Rob received the District Award of Merit. This is the top honor that a district can bestow upon an adult leader. In the photo, Rob is pictured with the other recipient, Jonathan Middleton (L) and District Chairman Joel Moore (R). In addition to his outstanding work as our Troop Committee Chairman, he also serves as the Cubmaster of Pack 29. At the District level, Rob chairs the Activities Committee, where he coordinates programs from the Pinewood Derby, to the District Banquet, and the highly successful District presence at Auburn CityFest. He has previously been the Cub Scout Roundtable Commissioner as well. 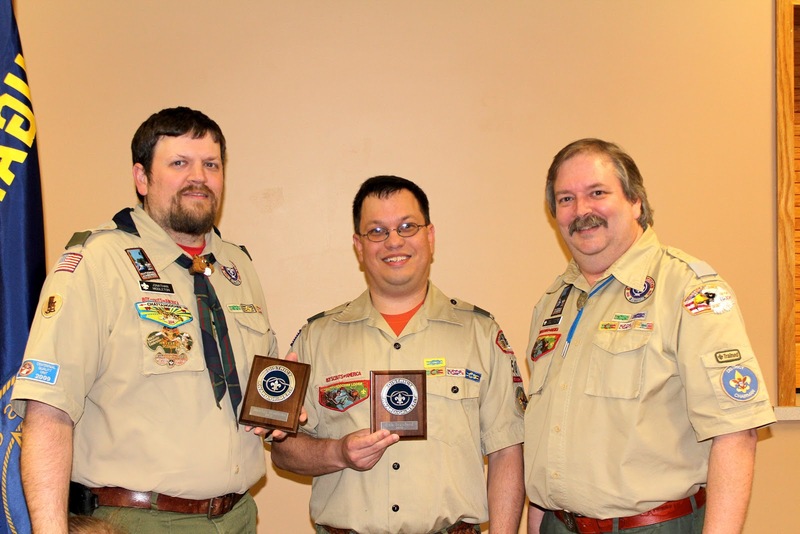 As was mentioned at the presentation, Rob is an Eagle Scout who believes in the values of Scouting. He lives those values in his daily life and that is what makes him such a valuable member of the Scouting program. Please congratulate Rob when you see him for the recognition of a job well done!